The central bank decision regarding keeping the interest rates unchanged give bullish momentum to AUD. The support rests at 0.71750 with resistance at 0.73070 which the weekly pivot point at 0.72270 is located in between the lines. 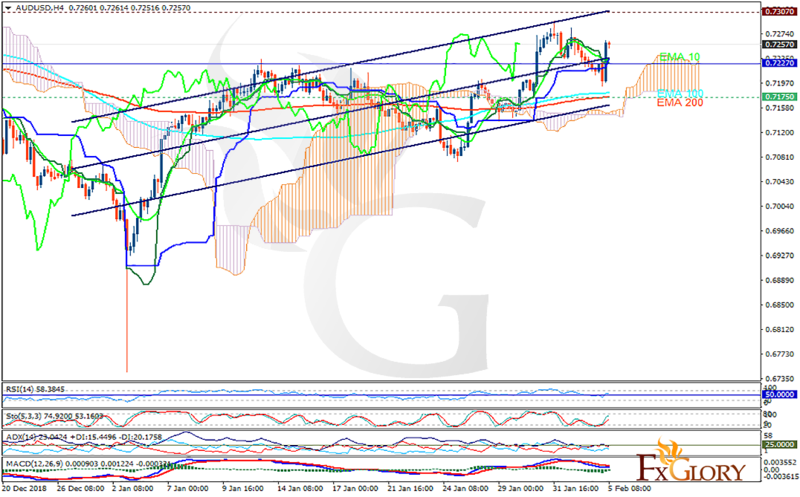 The EMA of 10 is moving with bearish bias in the ascendant channel and it is above the EMA of 200 and the EMA of 100. The RSI is falling towards 50 level, the MACD line is below the signal line in the negative territory and the Stochastic is showing upward momentum. The ADX is not showing any clear signals. The price is above the Ichimoku Cloud and below the Chinkou Span. The Tenkan-sen is and the Kijun-sen are both showing a horizontal trend. Long positions are recommended towards 0.731. Japan has published Nikkei Services PMI and the US will release Markit Services PMI Final and ISM Non-Manufacturing PMI. 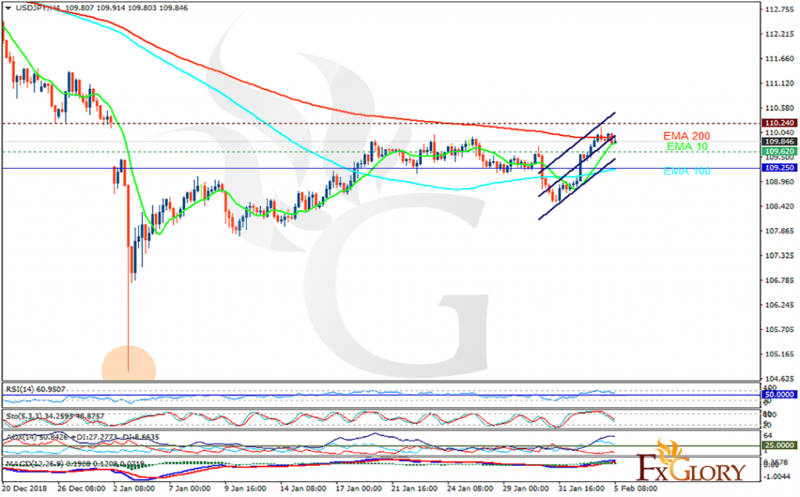 The support rests at 109.620 with resistance at 110.240 which both lines are above the weekly pivot point at 109.250. The EMA of 10 is moving with bullish bias in the ascendant channel and it is below the EMA of 200 and above the EMA of 100. The RSI is falling towards the 50 level, the Stochastic is showing downward momentum and the MACD line is above the signal line in the positive territory. The ADX is showing buy signal. USDJPY is growing upward slowly to recover from the previous downfall. Buyers can target 110.5. While USD is getting empowered, there are no strong economic data to support EUR. The support rests at 1.14180 with resistance at 1.14400 which both lines are below the weekly pivot point at 1.14530. The EMA of 10 is moving with bearish bias in the descendant channel and it is above the EMA 100 and the EMA of 200. The RSI is falling towards oversold area and the Stochastic is moving in low ranges. The MACD line is below the signal line in the negative territory. The ADX is showing sell signal. 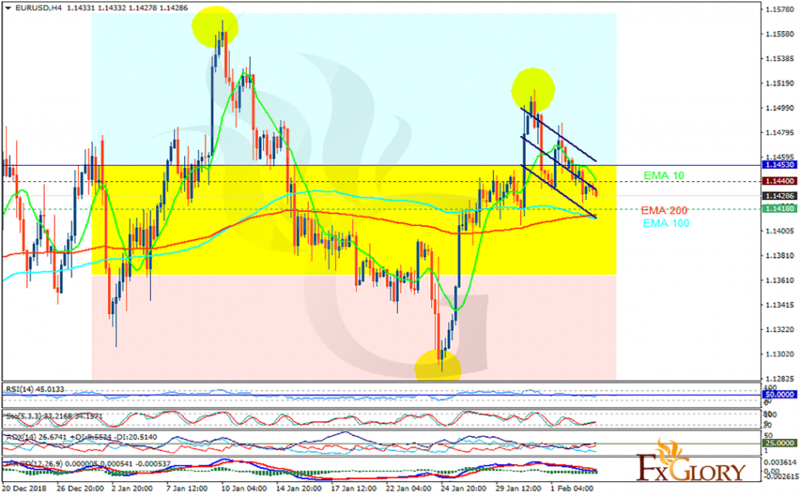 EURUSD may continue its bearish trend towards 1.1400.
looking for article or guideline for yourself?